BUILD just finished up a recent project on Seattle’s Queen Anne hill and it includes a couple of new details from our ever-evolving kit of parts. 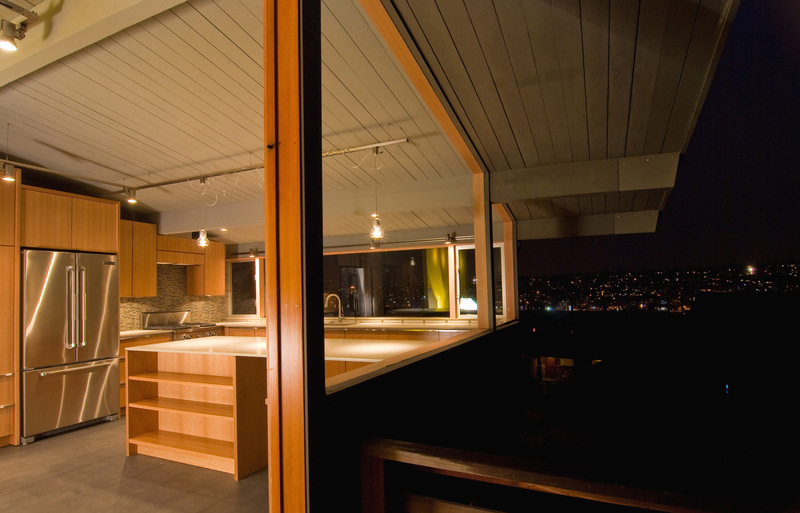 The project retained a significant portion of an existing mid-century modern home on the site and, like most MCMs, there were valuable materials to preserve. One of the main material decisions was to keep the existing oak hardwood floors at the main level. In reusing a 50+ year old floor, we typically recommend a darker finish to even out all of the blemishes the floor may have collected over the years; these may include discoloration from nails & staples, moisture stains, uneven weathering, and the occasional pet stains. In this case we went with an ebonized finish which evens out the oak boards to a nearly black shade but still allows the grain and texture to read through. The dark floors also allow a clean contrast between the white walls and lighter cabinets. The upstairs of the home, however, was entirely new and needed to be light-filled and bright. 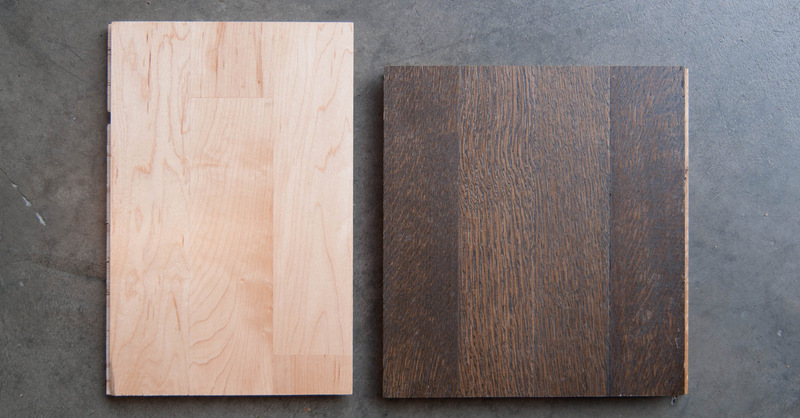 With the freedom to choose a new flooring material, a light, clear finished maple flooring was selected. The wood floors at each level are entirely different colors for different reasons and each is performing its own job very well. The only remaining design challenge regarding the floors was how to transition from the dark ebonized oak to the light maple. To us, warm-modernism is all about expressing natural tones, textures and material characteristics and this was a nice opportunity to do just that. Rather than downplaying or concealing the differences between the two floors, we decided to actually enhance the contrast between the ebonized oak and the clear-finished maple. This important moment of transition occurs at an important and highly visible area. 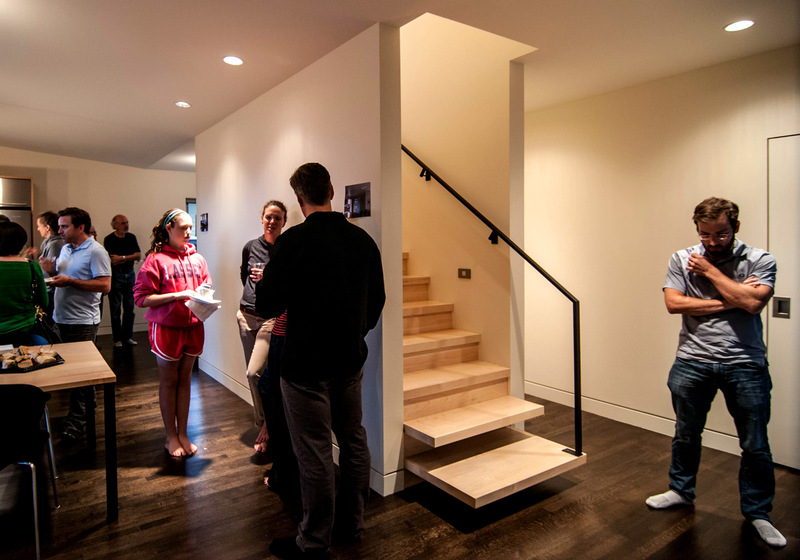 At the stairway between the main floor and upper floor, the very first step up is the threshold between moving horizontally and moving vertically; this same spot marks the transition between the dark, ebonized oak and the light, clear-sealed maple. 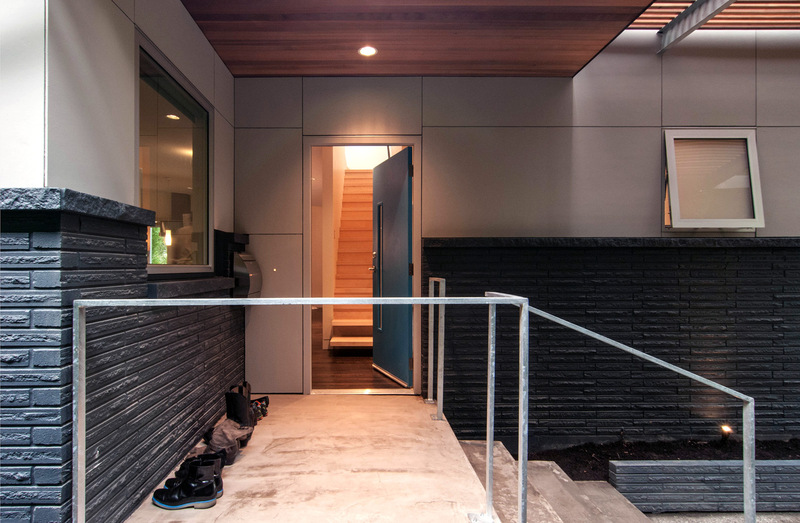 To exaggerate this step from one material to the next, we pulled back the side walls of the stair and cantilevered the bottom two treads out over the oak floor. We wanted a deliberate move between the two floors as well as the two materials and the floating appearance of the bottom treads achieves this all while playing by the rules of the building code. The structure behind the wood treads includes a custom fabricated ½” thick steel assembly that carries the gravity load of each tread to a steel attachment plate. The entire assembly looks like an ‘F’ with the top bar half the horizontal length as the bottom bar. This plate is then lag bolted to 4x beams within the stair structure. 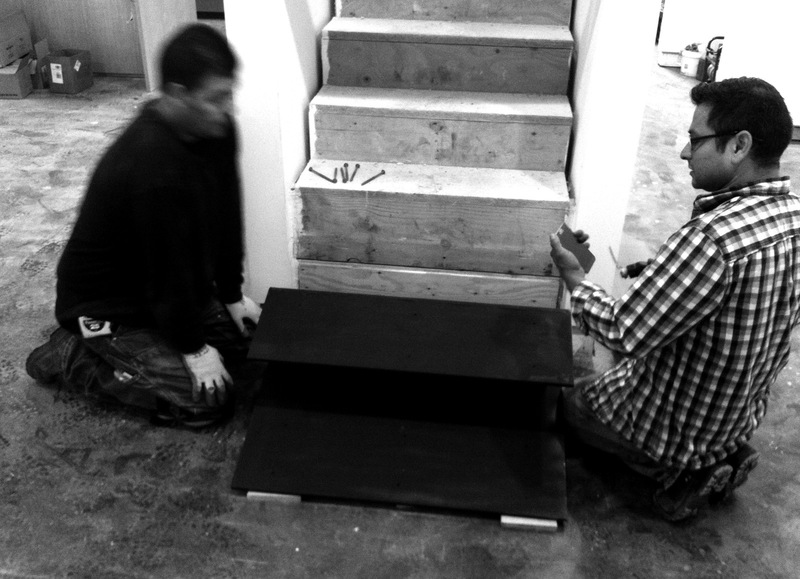 The steel is then concealed with maple hardwood to match the stair. Good, modern design should take the inherent construction challenges of a project and turn them into design opportunities. This is one small example that customizes a house without creating unnecessary and ornamental features within the home. 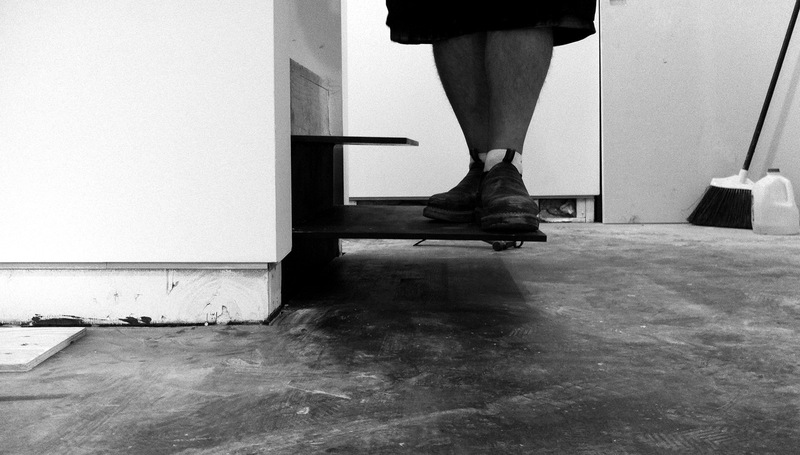 In the true modernist philosophy, shouldn’t you expose the steel structure that’s holding up the treads? It’s hard to tell from the b&w installation photo, but I bet the steel assembly is quite beautiful. @ Jamie – we thought about that, but then there would be a 3rd material competing for attention. We really wanted to play up the relationship between the two materials and the difference in plane. Lovely work, as always. But I have to take exception with the idea that the stair detail isn’t an “unnecessary and ornamental feature.” That detail, as pleasing and as well-executed as it is, is both unnecessary and ornamental. Every architecture has its ornament; the distinction is in the type of ornament, not its existence. What was the reasoning behind the handrail choices, both on the stair and the front porch. I am curious as to why it extends all the way to the bottom tread. 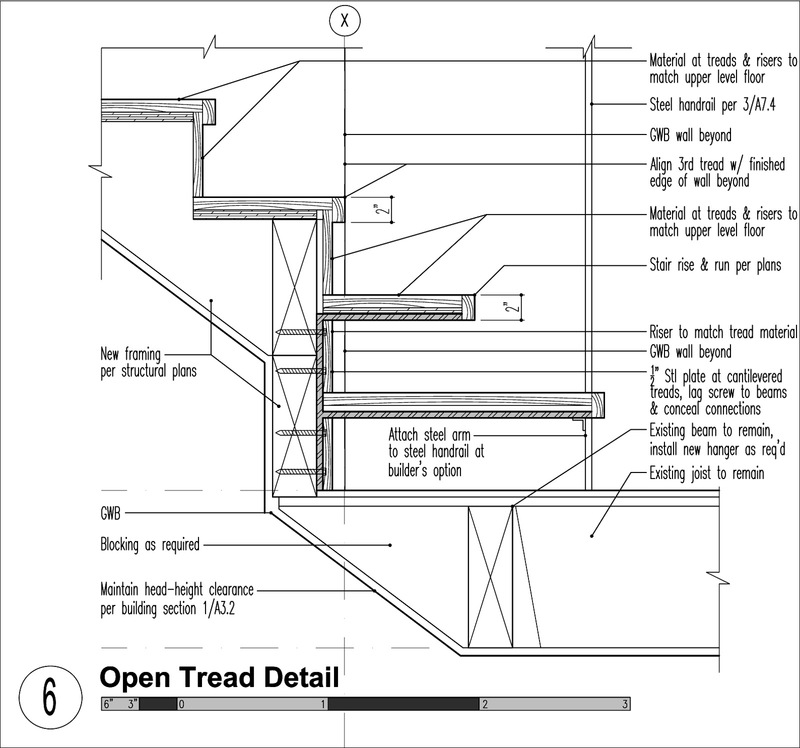 @ Mark – the International Residential Code requires that handrails extend down to the bottom tread. Nice work! I like the simplicity, though fear for shins for those who round their corners. The best example of a “warm” modern stair (and transition) I’ve ever seen is at the Nakashima studio in Pennsylvania. 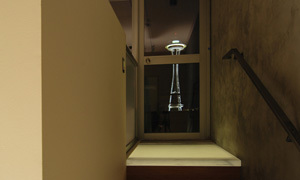 @Steve – nice stair, thanks for the link. Really nice idea and brilliantly executed! I have darker maple floors on the top level and a natural maple on the main. My issue now is how to color my wooden staircase between the upstairs and the main level as well as the stairs to the basement to facilitate the transition from light to dark without making it appear odd. Any suggestions?